On Sunday, May 28, the Center for Independent Futures Dream Team woke up before the sun rose. By 5:15 a.m., they were at the office, ready for the first leg of their journey into the city for the MB Bike the Drive. During Bike the Drive, our Dream Team and thousands of other bikers took over Chicago’s Lake Shore Drive, which was closed to cars for the event. The skyline on one side and Lake Michigan on the other perfectly framed miles of open road. 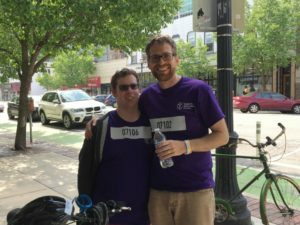 The cyclists who rode with the team included participants, staff members, and other community members, some of whom rode for the sixth year in a row. Two father-son duos rode this year, along with three staff members and three members of our Auxiliary Board. The ride set off from Chicago’s iconic Buckingham Fountain, where the Dream Team headed north. The trip to the end of Lake Shore Drive was nine miles, and many riders continued on their bikes all the way back to Evanston. Bike the Drive 2017 may be over, but you can still support the riders by helping them reach their fundraising goals. To support the Dream Team, visit their fundraising page at this link. 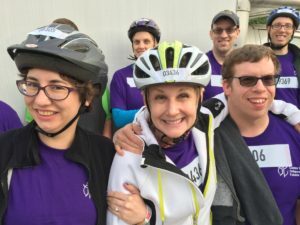 You can donate to the efforts of individual riders by clicking on the photos at the bottom of the page, or support the entire team by clicking on the orange “Donate to this fundraiser” button. Thank you to our team and all who supported their efforts to ride for hopes and dreams.